Welcome, Jayden, and thank you for taking time to talk with us today. We’ve been meeting some really interesting…people…recently in these interviews and you’re no exception – being an alien and all. So, to introduce you to our readers can you tell us a little about yourself and where you come from? My name is Jayden, just Jayden, and I just turned fifteen. I am from the planet Sirius, orbiting a star of the same name. We look just like you because we come from the same original seed. Our planet was colonized way before yours and we were tasked (by the Forefathers) to oversee the survival of all sister colonies, like you here on Earth. I live with my father on the Crisis Intervention Ship, (which comes to the aid of colonies in dire situations) along with 210 other people. I go to school and follow required training as I would if I lived planet side. How did you come to be Tommy’s mentor? What do you think of him? Now that’s a sore subject. I was told to not only watch over him, but to help him fit in. I don’t know if you realize how hard that was, because he didn’t know anything about us, about our technology, our ways…nothing! He’s from Earth, by the way and he didn’t even know how to use a digipad or take a shower here. You see, the Commander, Tommy’s father, is my father’s friend, and somehow the two of them thought that this would be a good idea. Anyway, nothing seemed to work out and I kept making mistakes, one that almost killed him too, but Father dealt with that. What do I think of him, you ask? Now I think he’s OK, and we have found that we have a few things in common. He’s not a bad guy and he never stopped being nice to me, no matter how mean I was. So I guess he’s all right. What made you change your mind about helping him fit in? So you did actually visit Earth with Tommy; tell us a little about your experience. Neither Tommy nor I knew that we were going there. It was because of a dangerous situation that I can’t really talk about, but yes, I did visit Earth. It was quite an experience. He had me collecting eggs from chickens, can you imagine? I rode a horse which was fun, and I got to play out in the snow. He showed me one of his notebooks. At least I think that’s what he called it, with his biology notes inside. Let me tell you, our digipads are so much better. I will admit that I fell in love with his mother’s library and I read a lot while everyone else slept. Once, we had to drive home from town in one of their personal transportation devices, a mini-van. I couldn’t take it, it was horrible. My legs went numb and I felt sick. I don’t know how they do that every day. We’ve got some random questions for you now about books – hopefully you’ll have read enough human stuff during your time with Tommy to be able to answer them. If you could be any character from any book – who would you be and why? Omni. I guess you probably don’t know who that is, but he’s from two books, the Price of the Phoenix, and the Fate of the Phoenix. He comes across as a bad guy because of what happened in the past, but he does care deep down inside. If I was him, I could only hope I’d get over it and help people, you know, because he’s that powerful. Why? I think it’s because when I first met Tommy I was very angry at having lost my mother, and especially angry with my father for not having saved her. He is a doctor after all. I was in a very dark place but because of Tommy I started to change, grow. Omni is also in a dark place and I kind of relate to that. Favourite fictional world – where would you love to live? That’s easy, Hogwarts and the world of Harry Potter. I only read a few of the books, but it really is a magical world. Tommy let me bring them back with us so I could finish them. Hmm, since I’m new to your literature, I would have to decide between Queen Jadis of Narnia, or Lord Voldemort. They both…how did Tommy put it, creeped me out? If you’d like to know more about Jayden and the adventures she’s shared with Tommy, you can check out their facebook page. 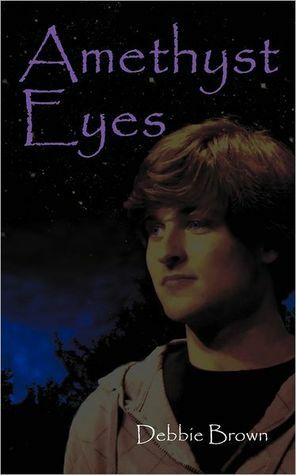 She also stars alongside Tommy in Debbie Brown’s book Amethyst Eyes, available now in over 100 online bookstores. This entry was posted in Character Interviews, Interviews and tagged amethyst eyes, character, debbie brown, interview, jayden, tommy. Bookmark the permalink. Thanks for the interview, I always love reading them from a characters pov.